The latest development in the relationship between the Kochs (right-wing heirs to a business fortune) and Trump (also the right-wing heir to a business fortune) is that the former have thrown the weight of their massive organization unhesitatingly behind the latter. 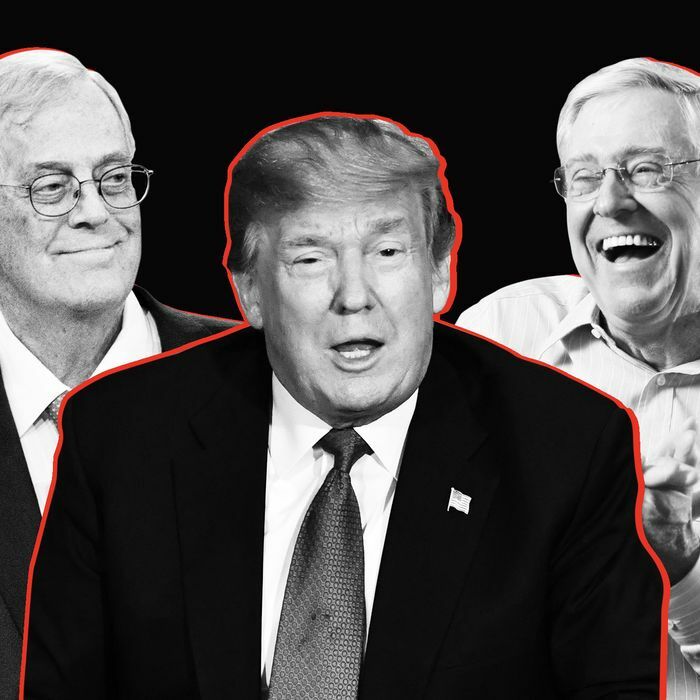 Largely satisfied with Trump’s conservative judicial appointments, lax regulation of business, and regressive tax cutting, the Kochs are spending several hundred millions of dollars to protect the Republican majority. Whatever points of contention remain between the two have been reduced to squabbles between friends. The Koch rapprochement mirrors a broader trend: Among the conservative intelligentsia — where resistance to Trump has always run far deeper than it has among the Republican rank and file — libertarians have displayed some of the greatest levels of friendliness to the Trump administration. The Wall Street Journal editorial page is a bastion of pro-Trump conspiracy-theorizing about nefarious deep-state plots, in addition to celebrations of the administration’s economic record. Grover Norquist, Stephen Moore, and Ron and Rand Paul, among others, have all staunchly defended the president. To be sure, some libertarians have dissented fiercely. The Niskanen Center has nurtured a cell of moderate libertarians that has lobbed attacks on the administration and its allies. But Niskanen’s rejection of Trump has come alongside a broader rejection of the priorities of the politically dominant wing of libertarian politics; they have criticized Trump for the same reasons most libertarians have supported him. Four years ago, a New York Times Magazine story predicted the onset of a “libertarian moment” in American politics. There was never any such movement among voters; indeed, the support Trump generated from his promise of terrific health care for all — plus closed borders, protectionism, and the maintenance of racial and gender hierarchies — reveals that the true unsatisfied demand in American politics was the opposite of libertarianism. Instead, libertarian influence has come in the form of deeply partisan Republican financial and political elites. The now-close working partnership is not as surprising as it might appear. Before the election, I argued that the Republican party was evolving into a synthesis of libertarian ends and authoritarian means. The party’s core elites were motivated by an economic agenda that bore little support among the voting public. Indeed, libertarians have understood this problem for decades; many of them see democracy as a process that enables the majority to gang up on the rich minority and carry out legalized theft through redistribution. Their highest notion of liberty entails the protection of property rights from the democratic process, and they have historically been open to authoritarian leaders who will protect their policy agenda. “The key is the libertarian idea, woven into the right’s ideological DNA, that redistribution is the exploitation of the ‘makers’ by the ‘takers.’ It immediately follows that democracy, which enables and legitimizes this exploitation, is itself an engine of injustice,” wrote Will Wilkinson, one of the dissident libertarians working at the Niskanen Center, last month. “The outsize stakes seem to justify dubious tactics — bunking down with racists, aggressive gerrymandering, inventing paper-thin pretexts for voting rules that disproportionately hurt Democrats — to prevent majorities from voting themselves a bigger slice of the pie.” The Kochs are emblematic of the sorts of libertarians Wilkinson identifies. The Post notes that Koch officials “now tread carefully” on trade and immigration, policies where they maintain some doctrinal differences with the administration. On these issues — which split the GOP generally — the administration has itself vacillated almost daily, so that neither faction within the party feels alienated. This has enabled them to concentrate on their points of unanimity, especially their broad defense of business and inherited wealth. You would think a libertarian might have some deep-seated qualms about leaving untrammeled executive power in the hands of an obviously ruthless and autocratic leader like Trump. The only practical way to restrain Trump’s efforts to carry out massive personal corruption and turn federal law enforcement into a political weapon under his control would be to help Democrats regain one or more chambers of Congress, so they could conduct oversight and act as a check on the executive branch. But the Kochs are committed to doing just the opposite: The highest priority of their political action this year is maintaining Republican control of Congress, which will enable Trump to escape meaningful oversight. The Kochs have presented this choice as a kind of nonpartisan idealism. “We have now increasingly followed the philosophy that made Frederick Douglass such an effective social-change entrepreneur,” Charles Koch announced. “And that is, as he put it, ‘Unite with anybody to do right, and no one to do wrong.’ ” But that isn’t quite accurate. They could still work with Republicans without spending hundreds of millions of dollars to maintain their hammerlock on power. They could, indeed, support Democrats while still working with both parties issue by issue. Their priority is aiding the party that shares their view of the primacy of protecting the makers from the takers. This is a perfectly predictable outgrowth of an Ayn Rand–inflected movement. The alliance between the Kochs and Trump exists not despite their libertarian ideology, but because of it.